180 pages | 1 B/W Illus. Rival understandings of the meaning and practice of the religious and the secular lead to rival public perspectives about religion and religious freedom in North America. This book explores how debates over the American Office of Religious Freedom and its International Religious Freedom Act (IRFA, 1998) and very recent debates over the Canadian Office of Religious Freedom (2013) have pitted at least six basic, but very different meanings of the religious and the secular against each other in often undisclosed and usually unproductive ways. Properly naming this ‘religious problem’ is a critical first step to acknowledging and conciliating their practically polar political prescriptions. It must be considered how we are to think about religion in political offices, both the Canadian and the American experience, as an essentially contested term, and one which demands better than postmodern paralysis, what the author terms political theology. This is especially critical since both of these cases are not just about how to deal with religion at home, but how to engage with religion abroad, where real peril, and real practical policy must be undertaken to protect increasingly besieged religious minorities. Finally, a principled pluralist approach to the religious and the secular suggests a way to think outside the ‘religious problem’ and productively enlist and engage the forces of religion resurging around the globe. The book will be of great use to scholars and students in religion and foreign affairs, secularization, political theology, and political theory, as well as professionals and policy makers working in issues relating to religion, religious freedom, and foreign affairs. "In this book, Joustra considers what many people at first had thought to be a refreshing moral cause, confronts the cacophony of criticisms, conflicting meanings, political agendas, and fast moving global changes that have surrounded it, discovers an approach to managing this debate (principled pluralism), and, all the while, retains his conviction that religious freedom is a worthwhile end of foreign policy, one that, in the end, defends highly vulnerable people. The result is an exceedingly rare combination of brainy sophistication and unyielding moral conviction." - Daniel Philpott, Professor, University of Notre Dame, USA. "Religious and secular actors compete in the political arena while at the same time "religion" and "secularism" are contested terms. 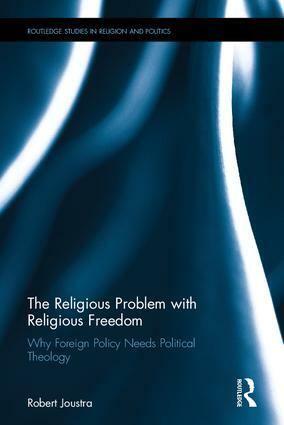 In his book The Religious Problem with Religious Freedom, Robert Joustra examines how rival conceptions of the religious and secular compete to influence the foreign policies of the US and Canada in general and specifically with regard to their policies of promoting religious freedom. He then proposes the concept of principled pluralism as an alternative strategy for these foreign policies. This book makes sense of a complex set of debates on an issue of increasing importance worldwide, and provides significant insight into how religious freedom is perceived from a multitude of secular and religious perspectives." - Jonathan Fox, Professor of Religion and Politics, Bar Ilan University, Israel. Robert Joustra is Associate Professor of Politics & International Studies at Redeemer University College, and Director of the Centre for Christian Scholarship. He is an editorial fellow at the Review of Faith & International Affairs, and a fellow with the Washington, D.C. think tank Center for Public Justice. This series aims to publish high quality works on the topic of the resurgence of political forms of religion in both national and international contexts. This trend has been especially noticeable in the post-cold war era (that is, since the late 1980s). It has affected all the ‘world religions’ (including, Buddhism, Christianity, Hinduism, Islam, and Judaism) in various parts of the world (such as, the Americas, Europe, the Middle East and North Africa, South and Southeast Asia, and sub-Saharan Africa). The series welcomes books that use a variety of approaches to the subject, drawing on scholarship from political science, international relations, security studies, and contemporary history. Books in the series explore these religions, regions and topics both within and beyond the conventional domain of ‘church-state’ relations to include the impact of religion on politics, conflict and development, including the late Samuel Huntington’s controversial – yet influential – thesis about ‘clashing civilisations’. In sum, the overall purpose of the book series is to provide a comprehensive survey of what is currently happening in relation to the interaction of religion and politics, both domestically and internationally, in relation to a variety of issues.